Unlike many revered audio brands, old school Brooklyn outfit Grado Labs hasn't yet stooped to deploying rappers, athletes, or style icons to market its awesome headphones and phono cartridges. But before you dismiss its first foray into the world of branded products out of hand, you should know two things. The partner is whiskey, and the headphones are pretty amazing. According to chief engineer (and Grado Labs founder) John Grado, the company gets calls from sports agents and marketers all the time, and he's never cared to bother with them. "I don't need to pay anyone to say my headphones are good," he told me yesterday when he dropped off a fresh set of the Bushmills x Grado headphones. So why go with Bushmills? For starters, Grado liked that he was working with an old company like his own—Grado Labs has been in the audio industry for 60 years. Moreover, the project was an opportunity to tackle a number of challenges, not the least of which was seeing if his very serious audio company could actually play nicely with new friends. On the surface, the new Bushmills x Grado headphones could read as pure gimmick. The company's cans have always been made of wood, and on this particular set, they happen to use the white pine barrels Bushmills uses to age its whiskey. 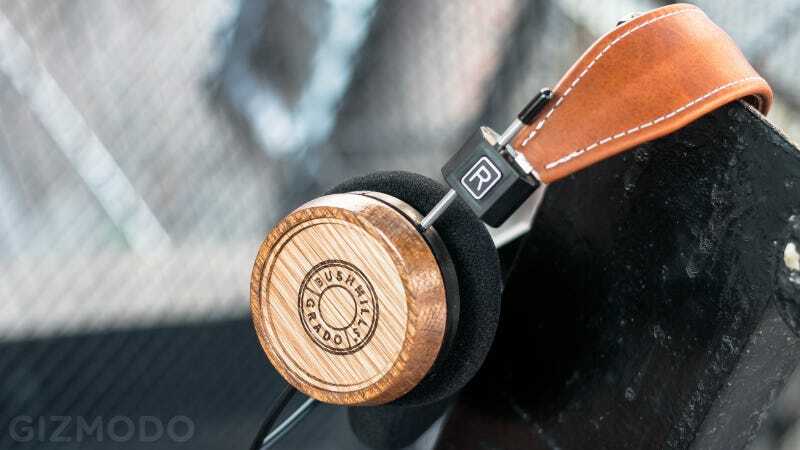 When Bushmills approached John Grado about the project, the first thing Grado did was make sure the boozy, brittle wood was actually something you could use to make a headphone. "We listened to the wood out of the barrels and we knew it was something that could be done." But producing the new headphones wasn't as simple as building an existing Grado design out of the new material and slapping a Bushmills logo on it. The requirements of the product forced Grado to build a closed-back headphone for the first time. Many audio nerds prefer open-back headphones because they've got ports that allow air—and therefore sound waves—to flow back and forth, giving the headphones a more open, natural sound than cans that are isolated from the world. But since a Bushmills collaboration necessitates a Bushmills logo somewhere these new cans are closed-back. They're open on the sides, though, so there's still some airflow. In terms of design, Grado had to come up with a way to turn barrels into earcups that both sounded great and could be reliably manufactured. Early prototypes were prone to cracking and breaking in the building process. To make the headphones sound right, Grado actually had to add mass in the form of a little tuning fork-like wooden piece behind the driver diaphragm to give the cups a little more heft and sturdiness. Grado's son, Jonathan (and Bushmills spokes-celebrity Elijah Wood, because sure) spot-checked the sound to make sure that younger audience would like the end product. As did we; they sounded great. "It's nice to know that these old ears still got it," says Grado. The sound you get from the Bushmills x Grado cans is warm and clear, with a sweet-spot right in the mid-range, as Grado products are known for. They're very lightweight, and compared to the industrial plastic and metal products out there, and the construction of the headband feels a little flimsy, which given the $400 price tag is going to put a lot of people off. We should probably point out that there are cheaper Grado offerings with comparable sound quality—not the reference-level stuff, but good nonetheless. Whether or not the Bushmills collaborations is a success depends on your perspective. For all their sonic excellence, the Bushmills x Grado headphones are going to appeal primarily to aesthetes because the traditional audio community will never take something like this seriously, no matter how incredible the cans sound. But for the rest of us, this is a hand-built product with a hand-built feel, and a lovely rustic wood finish. They're not kind of headphones that you're gonna throw in your backpack, but the people who buy them will probably want to. They're attractive, expensive, and delicate. They're refined like a fine whisky, and like a fine whiskey, whether it's worth the expense will remain a matter of debate. The headphones are available now form Turntable Lab.